Q. How do I request an item? If all copies are out on loan you need to place a request by selecting Request otherwise the book will be automatically renewed. Always check the shelves first for available copies. You can request any items the library holds excluding reference copies. 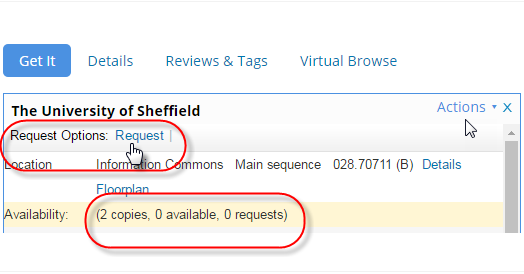 You only need to choose which Library site you wish to collect the book from and then click Request. Please be aware that The Library will email when the book is ready to collect. If the items you require are from Western Bank Library, you will only see that site as a collection option. This is because material from this site can only be collected on site. Part time, distance learners and students with other inclusive learning needs will be able to choose to collect for any site and material held at other sites can also be collected at any other site. We will email you when the item is ready to collect from your chosen pick-up location. If there is a copy on the shelves, it is quicker to go and fetch it yourself rather than make a request, other users will be able to borrow any item found on the shelves even if there is a request on it.